Never realised how passionate I was about this little ebaby of mine…….MY BLOG. Coz for the first time ever…and to my mum’s surprise….I was cooking n trying out new things in her kitchen ….while on a lazy lazy yearly vacation at my parents place in Delhi! Yup! Never before had I cooked while vacationing here….after all “being thoroughly pampered” is what describes MUM’s HOME BEST! 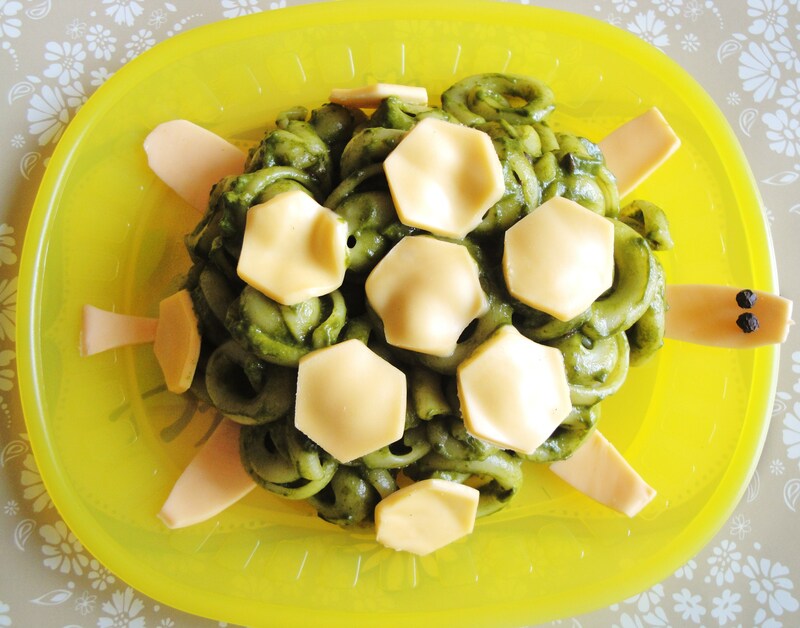 So, Here I post yet another yummy kiddie recipe……Hope you enjoy it! In a pan take olive oil and sauté the cumin seeds along with garlic till golden brown in colour. Pour in the spinach puree and bring to a boil. Now add pepper and oregano and simmer. Gently pour in the milk. Please keep stirring until the milk mixes well with the spinach. Add the cream and stir well. Now add salt to taste. Bring the spinach sauce to a boil and keep aside. In a pot add pasta to about 1 litre boiling water and sprinkle ½ tsp salt. Let it boil for about 20 minutes. Check, if the pasta is just about done then strain. Now add all the cooked pasta to the spinach sauce and gently stir. Mix until all the pasta is coated well with the spinach sauce. 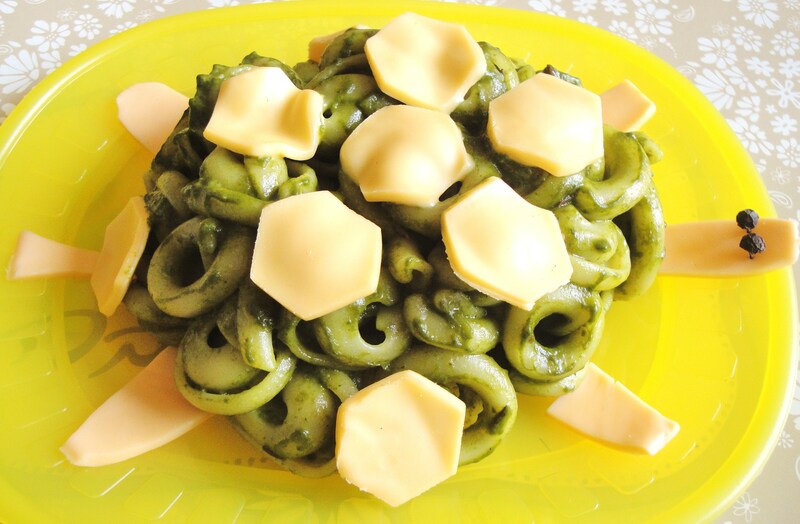 Fill a medium size bowl with the pasta in spinach sauce. Press a bit from the top. Turn the bowl full of prepared pasta upside down on a flat plate (for the turtle back). Cut out hexagonal and a few other pieces of a cheese slice as shown in the picture. Place them on the turtle along with the pepper corns as shown in the picture. The turtle surprise is ready to serve! 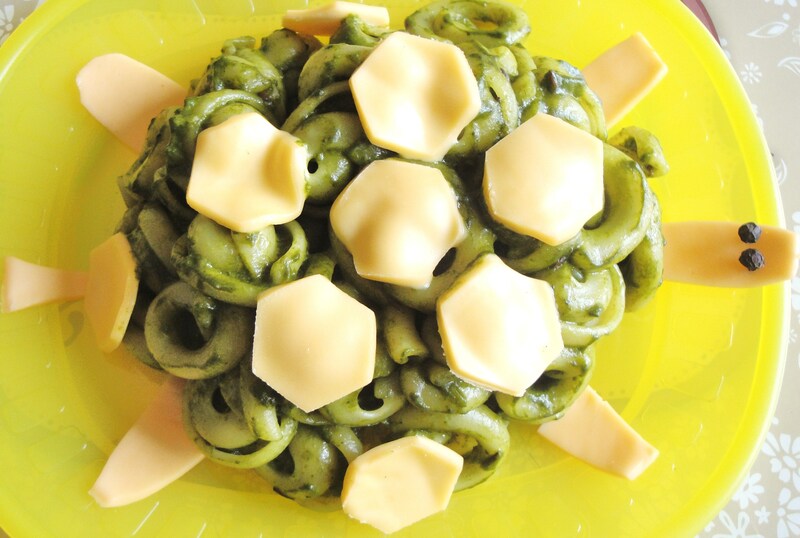 Kiddie Tip: You could use green and black olives and place them on the cheese to further decorate the turtle’s back !! !